List of Ingredients: wheat flour, water, Spring Onion, vegetable oil, salt, yeast. Hebei Newcorn Food Co., Ltd. was founded in Jan 21st, 2011, registered capital of 30 million yuan. It Located in the Zhaoxian County where is the High-quality wheat production base of China and the Chinese academy of agricultural sciences' experimental base, we are specialized in the research and development and production of cold chain class ready-to-eat food and functional health food. It is the key construction project in Hebei Province, at present, it is the most modern ready-to-eat food production factory with the biggest scale, the most advanced equipment, the highest level of professionalization, the best production sanitation condition and cold storage facilities in Hebei Province. The factory covers 113 mu, the main structure covers more than 21 thousand square meters, contains modern production workshop, cold storage, R&D office building and subsidiary facility, it was named the leading enterprise of agricultural industrialization of shijiazhuang city in 2012. 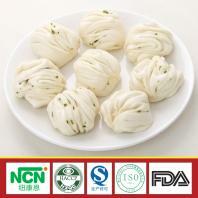 Annual production of 144 million of quick frozen buns and snow pear juice steamed buns, 200 million of quick frozen sweet corns and quick frozen sticky corns, and more than 8000 tons of frozen vegetables, such as quick frozen asparagus and mushroom etc. In order to pursue high standard quality and excellent flavor, we adopt the method of order agriculture to get raw material, strictly select high quality assured non-gmo and green health ingredients. On the basis of through the national QS certification, we are strict with ourselves to aim to the international higher standard, apply and through FDA (USA) and EFSA (EU) certification what are not mandatory requirement of the international and industry. We carry out the fully closed, whole industry chain and traceability one-stop service from choose raw material to R&D of production, standardized production, quick-freezing, double temperature distribution, direct sales stores and multi-channel distribution. We based the production base in north China, radiated national market, and carry out export business worldwide. We plan to build bases for raw material supplement and production in some districts and countries, and make the sales network cover the whole world. Sales service model conform to the age and innovate constantly, at present, we have used new O2O business model for sales operation, built advanced, intelligent and integrated O2O E- commerce service platform, achieved online order and payment, offline consumption experience, exchange interaction with customers without distance and time difference, convenient and service customers maximally. Our company is specialized exporter, manufacturer and supplier of frozen steamed flower roll in China.